There are a lot of things to think about when you’re looking for the best propane generator which is why we did the research needed to put together this propane generator buying guide. We researched some of the best-known brands and top-selling machines to help you figure out which one is the best for you. Before we get into our reviews, let’s take a quick look at some of the important features you should know about before you start shopping. Watts: Watts measure power. So, the more watts your generator has, the more power it has. How many watts do you need? That truly depends on what you’re planning to power when the lights go out. 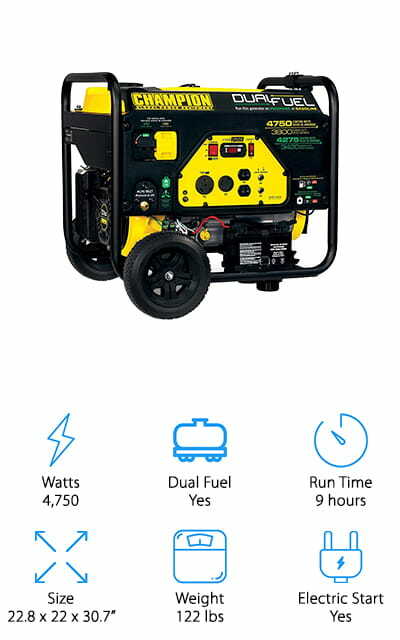 Dual Fuel: All of these generators can run on gasoline or propane, hence, “dual fuel.” It gives you a little bit of an option but one thing to keep in mind is you generally get more time out of propane. Run Time: Run time varies from model to model and greatly depends on the kind of fuel you use. 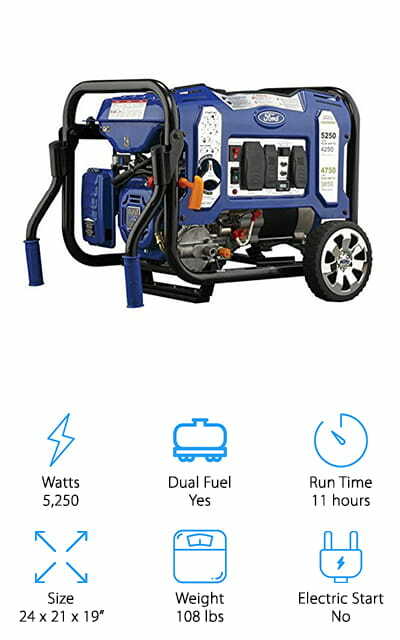 While putting together our reviews, we found generators that can run from 9 hour to 20 hours. Size: These machines are all portable but if they’re too large, it could be hard to store them or get them where you need them to go. Especially if you’re planning to take them on a trip with your RV. Weight: Some of these generators are very heavy at more than 200 pounds. For comparison, we did find one that only weighs about 50 pounds. Make sure you can lift your generator with a few helping hands - don’t try it alone. Electric Start: This means that the machine will start at the push of a button. The only problem? What happens if the start battery runs out of juice? The best choice is a generator with both an electric and manual start. 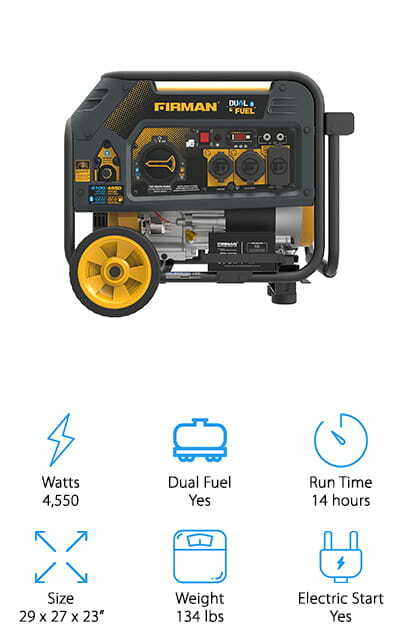 Now that you know a little more about generators, let’s take a look at our list. Whether you’re looking for a 50 amp propane generator or you just want something portable, you’ll find a wide variety here. Start with our top and budget picks, they’re the first 2 items on the list. Keep reading if you can, we think you’ll be able to find something you like. Okay, let’s start the engines and get right into our propane generator reviews. 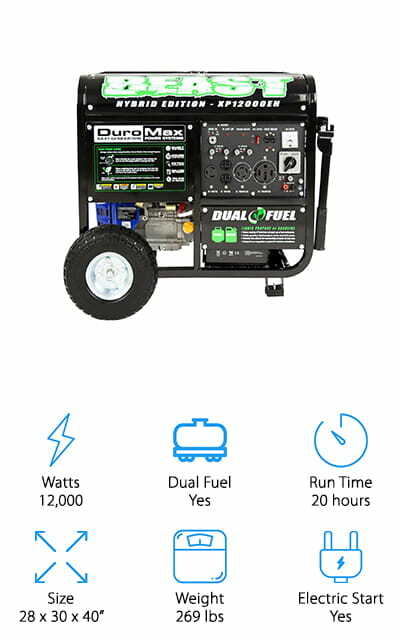 The DuroMax XP12000EH Generator is or top pick and the best portable propane generator we found in our research. Dual fuel technology allows is to run on propane or gas and it even has a quiet muffler and isolated motor mounts to reduce engine noise. The panel contains an oil warning light, voltmeter, and power outlets so the things you need are right at your fingertips. This generator also features a low oil shut-off that will protect the engine from any damage. That’s not all. The power panel features individual circuit breakers that help prevent overload. Plus, it uses a spark arrestor which makes it safe for use in US National Parks. This portable unit packs an incredible 12,000 watts and can run up to 20 hours on propane. Champion Dual Fuel RV Generator is the best cheap propane generator that we found. It runs on either gas or propane. You get 9 hours from a full tank of gas and 10.5 hours with a 20 pound propane tank. Not bad for the price. The push button electric start is really easy to use and it even includes the battery. All of the outlets feature Volt Guard which protects your appliances in the event of a power surge. While this generator was designed for use in RVs, it’s a convenient and affordable machine that comes in really handy during any emergency situation. It’s portable, too, just roll it onto the never-flat tires and use the folding handle for easy transport. 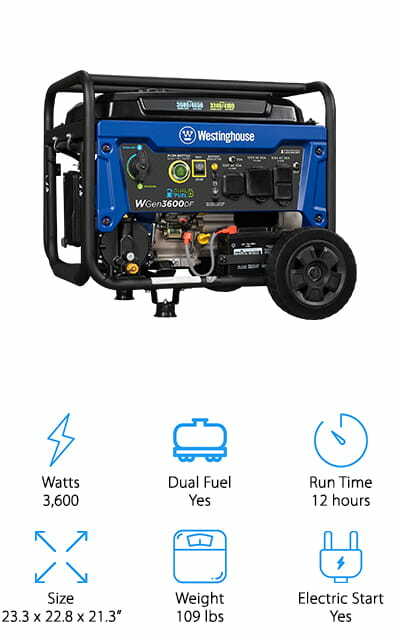 One thing we especially like about the Westinghouse 3600DF Generator is that it’s a remote start propane generator. Just use the key fob remote button and you can turn it on in the middle of a power outage without having to go outside or even leave your home. You can use either gasoline or propane and it can run up to 18 hours at a time on a single tank. For safety, it has an automatic low oil shutdown. That’s not all, the cast iron engine sleep was built to last a long time. Just about everything you need to get started is included: oil, oil funnel, tool kit, and manual. There’s some small assembly required, too, just put on the wheels and hook up the battery. 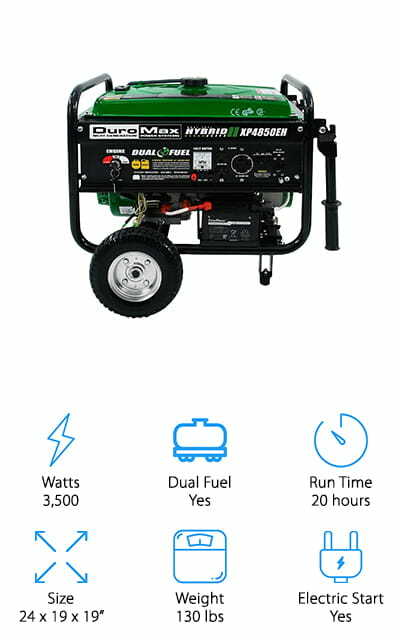 The Duromax XP4850EG Generator is the best propane generator for home but it comes in a portable package. The heavy duty frame features 4 isolated motor mounts which means that the operation is as quiet as it can be. You can run it using either propane or gasoline plus with 20 hours max run time on propane, 8 on gasoline. The power panel contains the key start switch, voltmeter, circuit breaker, and outlets as well are the advance warning oil light. Plus, this generator also has low oil shutoff to protect the engine from damage when the oil gets too low. And get this. It has an electric start that’s really easy to use but also has a recoil start so you have a backup just in case the battery is drained. While there’s no such thing as a silent propane generator, the Pulsar PG10000B16 is about as quiet as a generator of this size can be. It has a convenient electric start but you can also use the recoil backup in case the starter battery is dead. It runs on either gas or propane. You can seamlessly switch between the fuel sources, too, so you won’t have a blip in your power. The steel frame is durable and strong and it’s really easy to move with the never-flat wheels and drop down handles that are really easy to steer. When the storm is over, you can easily get it back into storage or take it with you to your campsite for a long weekend of glamping. 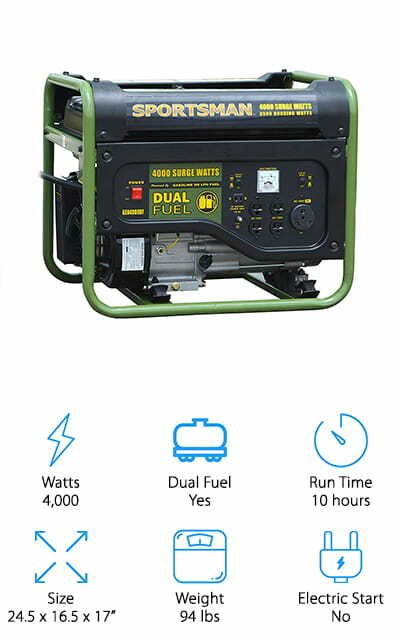 Another awesome choice, if you’re looking for a propane gasoline generator, is the Sportsman GEN4000DF Generator. At 50% load, it can run up to 10 hours with a full tank of gasoline or 12 hours with 20 pounds of propane. It’s ideal whether you’re looking for something to keep your refrigerator running with the power goes out or you want a machine to use with your RV when you’re out on the road. It includes a 5-foot propane fuel hose with regulator to get you started. We’ve said before, there’s no such thing as a quiet generator but, at 69 Db, this Sportsman is about as loud as a vacuum cleaner. We like that it’s versatile and portable so you can get as much use out of it as possible. The Champion 3500-Watt Portable Generator is another great option if you’re looking for the best propane generator for sale. This dual-fuel machine has a great control panel that allows you to monitor voltage, hertz, and run-time hours as well as output and maintenance intervals. The low oil shut-off sensor prevents engine damage by turning it off when the oil runs low. That’s not all, it’s even equipped with Cold Start Technology so you won’t be stuck trying to get it to start working when it’s cold outside and time is of the essence. The built-in surge protector keeps your appliances and equipment safe just in case. 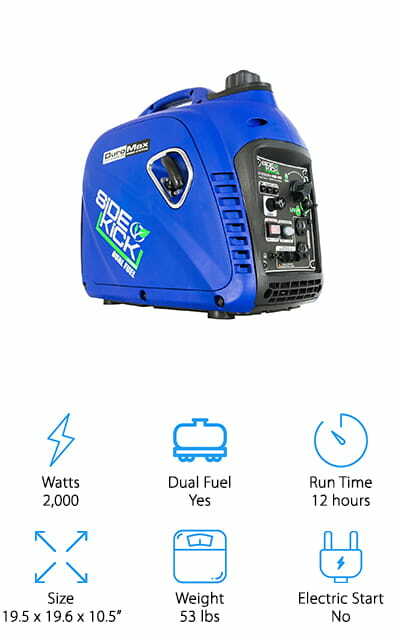 This generator includes a 3-year warranty and they even offer free lifetime technical support from experts who can help with any problems that come up. Next up is the Firman Hybrid Series Generator. It runs on either gasoline or propane and has a possible 14 hour run time. This model is a little quieter than comparable generators, coming in at only 67 decibels, which isn’t quite as loud as a vacuum cleaner. The electric start is simple and easy to use plus the starter’s battery is actually charged by the generator itself as it runs. It also has a recoil start in case the battery stops working for any reason. Included are a 5-feet extended propane hose which is a little easier to work with due to the extra length. You also get a wheel kit that contains 8” heavy duty, never flat tires and a U-shaped padded handle which makes it easy to get from here to there. This propane inverter generator from DuroMax is called the SideKick and it’s perfect for your more sensitive electronics. Get this: you can actually daisy chain 2 of these together for twice the power. All you need to do it get the parallel cables and use the parallel ports and you go from 2000 watts to 4000. One of the best things about this one is how portable it is. At only 47 pounds, it really easy to maneuver using the integrated handle. It has a pull starter which means you never have to worry whether a starter’s battery is going to work or not, which is always a concern with models that only have an electric starter. Switching from gas to propane is simple and only take a few seconds. One pick for a more than 5000 watt propane generator is the Ford FG5250PBR. It features a reliable recoil start that doesn’t depend on a battery. Plus, the low oil sensor helps prevent any engine damage by letting you know when you need to refill. 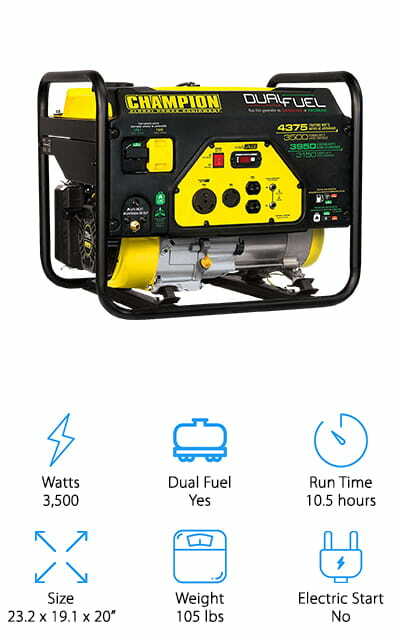 This generator can run on either propane or gasoline and gives you up to 11 hours at a 50% load. It’s powerful enough to run 2 major appliances or multiple smaller ones. It features an in-sight fuel gauge and a digital hour meter so you can judge how much time you have left. That’s not all. 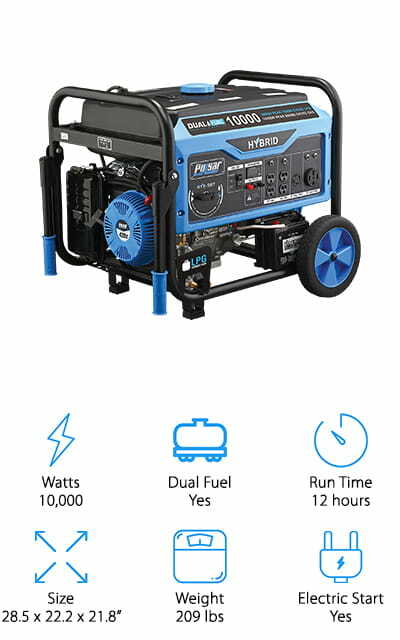 This generator comes with a lot of great extras, too, including no-flat tires, dual drop handles, engine oil, and even the tools you need for assembly and maintenance.